Unilateral congenital ptosis with poor levator function of ≤4 mm continues to be a difficult challenge for the oculoplastic surgeon. Surgical correction can be accomplished with unilateral frontalis suspension, maximal levator resection, or bilateral frontalis suspension with or without levator muscle excision of the normal eyelid. Bilateral frontalis suspension was proposed by Beard and Callahan to overcome the challenge of postoperative asymmetry, allowing symmetrical lagophthalmos on downgaze, postoperatively. However, most surgeons and patients prefer unilateral correction on the abnormal eyelid either with a frontalis suspension or maximal levator resection. Frontalis suspension may be performed through the various surgical techniques using different autogenous or exogenous materials. Autogenous fascia lata is considered the material of choice with low recurrence rates but carries the drawbacks of the difficulty of harvesting and postoperative morbidity from the second surgical site. Recent reports have suggested that maximal levator resection provides improved cosmesis, a more natural contour, and avoids brow scars. Although both treatments have shown to have similar success rates, there is much debate about what the most favorable method for treating severe unilateral ptosis. We review the literature on the various surgical treatments for unilateral severe congenital ptosis, including the rationale, advantages and disadvantages of each technique. Congenital ptosis with poor levator function is one of the most challenging procedures for oculoplastic surgeons. In particular, the optimal surgical correction for unilateral severe congenital ptosis remains highly controversial. Several surgical procedures have been demonstrated to treat severe unilateral congenital ptosis with variable outcomes and complications. Two main surgical options are frontalis suspension and maximal levator resection. Although both methods have been reported to have satisfactory surgical success for unilateral congenital ptosis the debate on which is the optimal treatment with lower complication rates still exists. For the treatment of congenital ptosis, levator function, severity of ptosis, laterality, associated diseases (i.e., blepharophimosis, Marcus-Gunn jaw-winking syndrome), and surgeon's preference should all be factors to be considered. Levator resection is conventionally carried out for patients who have fair-to-good levator function of more than 4 mm, whereas frontalis suspension is reserved for those with poor levator function of <4 mm.,,,, Some oculoplastic surgeons have advocated maximal levator resection as the first choice of surgery even in ptosis patients with poor levator function.,,,,,,,, However, there is always concern that levator resection in patients with poor levator function would result in undercorrection, even with maximal levator dissection and resection., This would naturally result in some surgeons preferring frontalis suspension in cases of severe ptosis. However, a study of maximal levator resection in unilateral congenital ptosis with poor levator function found no statistically difference in outcomes between two groups of patients, one with preoperative levator function of 0–2.0 mm and the other 2.5–4.0 mm. Another study similarly showed that unilateral congenital ptosis with <2 mm of levator function achieved satisfactory results in 81.8% with maximal levator resection. Spontaneous brow elevation is crucial for obtaining excellent lid height after frontalis suspension surgery. In cases of amblyopia or operation on the nondominant eye, failure to recruit the ipsilateral frontalis muscle, can occur after unilateral brow suspension due to fixation preference of the fellow normal eye. Since patients with unilateral congenital ptosis are susceptible to amblyopia, undercorrection is not uncommon after unilateral frontalis suspension surgery. For this reason, bilateral frontalis suspension or unilateral levator surgery can be recommended to overcome the above problem. Levator resection surgery has been shown to result in marked the improvement of postoperative levator muscle function of 2.9–5.4 mm, which induces a favorable effect on the surgical success, especially for patients with a poor levator function., Natural elevation movement of the eyelid can be produced in a superior-posterior direction following levator resection surgery. It allows normal physiologic motion of the upper eyelids as opposed to the enforced use of sling materials in frontalis suspension surgery. A general surgical technique for treating unilateral congenital ptosis with poor levator function of ≤4 mm is frontalis suspension surgery. As the levator aponeurosis is inherently weak, another motor vector is necessary to raise the eyelid. The frontalis muscle provides both functions of suspension and elevation. The important goal of the surgery is to raise the eyelid by creating a direct connection between the frontalis muscle and the tarsal plate of the upper lid. This allows an elevating force to be transmitted to the eyelid during contraction of the frontalis muscle, in addition to a suspensory force in primary gaze. Frontalis suspension surgery is generally considered a technically simple and effective procedure to elevate the eyelid. Frontalis suspension can be accomplished with either bilateral or unilateral surgery. Some authors recommend bilateral frontalis suspension procedure for the treatment of unilateral poor-function congenital ptosis.,, Advocates of the bilateral approach are concerned about postoperative asymmetry during eyelid closure, blinking, and down gaze. Beard advocated excision of both the affected and normal levator muscles to create bilateral symmetrical ptosis followed by bilateral frontalis suspension with fascia lata. Some levator function is believed to remain in the normal eyelid even after being severed due to unseparated attachments such as the suspensory ligament in the superior conjunctival fornix, resulted in the elevation of the upper eyelid. Callahan recommended bilateral frontalis suspension with preservation of the normal levator muscle. However, bilateral surgery would mean putting the normal eye at risk of postoperative complications such as lagophthalmos, exposure keratopathy, entropion, and eyelash ptosis. Most oculoplastic surgeons, patients, and guardians would naturally prefer to operate only on the abnormal side when treating unilateral congenital ptosis, without needing to destroy normal structures compared to bilateral surgery. Patients with unilateral surgery unconsciously adjust relatively well to unilateral lagophthalmos and lid lag, both becoming less apparent by voluntary orbicularis contraction with time. Unilateral frontalis suspension ,, and maximal levator resection ,,,,,, have been recommended as approaches that intervene only on the deficient side. Whitnall's sling differs from maximal levator resection in that the upper eyelid is attached to the Whitnall's ligament after maximal resection of the aponeurosis in the former, while fixation sutures may be placed as high above the Whitnall's ligament as necessary in the latter to obtain satisfactory intraoperative eyelid level. Opponents of the Whitnall's sling may argue that Whitnall's ligament of patients with ptosis may be atrophic or dehiscent, and hence may provide weak and insufficient support for severe congenital ptosis. The medial and lateral horns of the levator aponeurosis are cut during maximal levator resection according to the desired amount of levator complex to be resected.,,,,, Some have emphasized that complete dissection of the lateral and medial horns is the most important surgical step in maximal levator resection. Recently, however, some surgeons have preferred to preserve the horns for providing vertical support to the eyelid and allow better eyelid contour., Transection of the medial and lateral horns can result in the destruction of the normal structures of the lacrimal gland and reflected tendon of the superior oblique muscle. It has been proposed that complete dissection of the levator aponeurosis and Muller's muscle from the tarsal plate and conjunctiva to above the level of Whitnall's ligament until the desired intraoperative lid height is obtained is the crucial step to obtaining a good surgical outcome, rather than transection of the levator horns per se., In a series of 243 patients with unilateral severe congenital ptosis who underwent maximal levator resection, the levator complex was sufficiently dissected superiorly without severing the medial and lateral horns of the levator aponeurosis. Anchoring sutures from the tarsal plate were fixed at the level of or above the Whitnall's ligament with the intraoperative height of the upper eyelid adjusted to the level of the superior limbus in patients under general anesthesia and 1 mm higher than the contralateral eyelid in patients with local anesthesia. Ninety-three percent (226/243 eyelids) had satisfactory results after maximal levator resection without the need to transect of the levator horns. After maximal levator resection or frontalis suspension operation, postoperative lid lag on down-gaze and lagophthalmos are inevitable. Unnatural eyelid movement and sluggish or incomplete blinking are almost always present although eyelid symmetry is generally obtained in primary gaze with favorable surgical outcomes. Mild to moderate exposure keratopathy can develop in all patients after correction of severe congenital ptosis, whatever the procedure. The cornea can be protected by voluntary contraction of orbicularis muscle and keratopathy is usually prevented with lubricants or lid taping. Nonetheless, significant corneal problems can be encountered in the postoperative period.,, Furthermore, postoperative lagophthalmos, lid lag on down-gaze, and sluggish blinking should be fully informed to the patient and parents preoperatively. If necessary, this can be improved with the release of the levator complex and skin incision, as well as with the recovery of the pretarsal orbicularis muscle with time after the operation. Other common complications of frontalis suspension surgery or maximal levator resection include undercorrection, overcorrection, poor eyelid contour, ectropion, deformity of the crease, and conjunctival prolapse. The use of nonautogenous material in frontalis suspension surgery can lead to potential foreign body tissue reaction, granuloma formation, hypertrophic scar, extrusion, and infection. Surgical treatment of unilateral congenital ptosis with poor levator function is still one of the most challenging tasks for oculoplastic surgeons since complications such as undercorrection, lid asymmetry, and poor cosmetic results are common postoperative complications. Frontalis suspension surgery has been favored in the treatment of unilateral severe congenital ptosis in the past decades. However, maximal levator resection also provides favorable results with more physiological and natural eyelid movement and possibly fewer complications. Challenges pertaining to the best option for the management of unilateral congenital ptosis with poor levator function still remain, and the debate regarding the ideal surgical procedure may persist for some time to come. The study was conducted in accordance with the Declaration of Helsinki and was approved by the local ethics committee of the institute. Informed written consent was obtained from all patients prior to their enrollment in this study. The authors would like to acknowledge the help of Stephanie Ming Young with proofreading. Wong VA, Beckingsale PS, Oley CA, Sullivan TJ. Management of myogenic ptosis. Ophthalmology 2002;109:1023-31. El Essawy R, Elsada MA. Clinical and demographic characteristics of ptosis in children: A national tertiary hospital study. Eur J Ophthalmol 2013;23:356-60. Griepentrog GJ, Diehl NN, Mohney BG. Incidence and demographics of childhood ptosis. Ophthalmology 2011;118:1180-3. Anderson RL, Baumgartner SA. Amblyopia in ptosis. Arch Ophthalmol 1980;98:1068-9. Berry-Brincat A, Willshaw H. Paediatric blepharoptosis: A 10-year review. Eye (Lond) 2009;23:1554-9. Lee V, Konrad H, Bunce C, Nelson C, Collin JR. Aetiology and surgical treatment of childhood blepharoptosis. Br J Ophthalmol 2002;86:1282-6. Cates CA, Tyers AG. Outcomes of anterior levator resection in congenital blepharoptosis. Eye (Lond) 2001;15:770-3. Berke RN, Wadsworth JA. Histology of levator muscle in congenital and acquired ptosis. AMA Arch Ophthalmol 1955;53:413-28. Berke RN. Results of resection of the levator muscle through a skin incision in congenital ptosis. Trans Am Ophthalmol Soc 1958;56:288-322. Carter SR, Meecham WJ, Seiff SR. Silicone frontalis slings for the correction of blepharoptosis: Indications and efficacy. Ophthalmology 1996;103:623-30. Crawford JS. Repair of ptosis using frontalis muscle and fascia lata: A 20-year review. Ophthalmic Surg 1977;8:31-40. Small RG. The surgical treatment of unilateral severe congenital blepharoptosis: The controversy continues. Ophthal Plast Reconstr Surg 2000;16:81-2. Pacella E, Mipatrini D, Pacella F, Amorelli G, Bottone A, Smaldone G, et al. Suspensory materials for surgery of blepharoptosis: A systematic review of observational studies. PLoS One 2016;11:e0160827. Ben Simon GJ, Macedo AA, Schwarcz RM, Wang DY, McCann JD, Goldberg RA, et al. Frontalis suspension for upper eyelid ptosis: Evaluation of different surgical designs and suture material. Am J Ophthalmol 2005;140:877-85. Wright W. The use of living sutures in the treatment of ptosis. Arch Ophthalmol 1922;51:99-102. Wheatcroft SM, Vardy SJ, Tyers AG. Complications of fascia lata harvesting for ptosis surgery. Br J Ophthalmol 1997;81:581-3. Wagner RS, Mauriello JA Jr., Nelson LB, Calhoun JH, Flanagan JC, Harley RD, et al. Treatment of congenital ptosis with frontalis suspension: A comparison of suspensory materials. Ophthalmology 1984;91:245-8. Deenstra W, Melis P, Kon M, Werker P. Correction of severe blepharoptosis. Ann Plast Surg 1996;36:348-53. Baroody M, Holds JB, Vick VL. Advances in the diagnosis and treatment of ptosis. Curr Opin Ophthalmol 2005;16:351-5. Epstein GA, Putterman AM. Super-maximum levator resection for severe unilateral congenital blepharoptosis. Ophthalmic Surg 1984;15:971-9. Mauriello JA, Wagner RS, Caputo AR, Natale B, Lister M. Treatment of congenital ptosis by maximal levator resection. Ophthalmology 1986;93:466-9. Press UP, Hübner H. Maximal levator resection in the treatment of unilateral congenital ptosis with poor levator function. Orbit 2001;20:125-29. Park DH, Choi WS, Yoon SH, Shim JS. Comparison of levator resection and frontalis muscle transfer in the treatment of severe blepharoptosis. Ann Plast Surg 2007;59:388-92. Al-Mujaini A, Wali UK. Total levator aponeurosis resection for primary congenital ptosis with very poor levator function. Oman J Ophthalmol 2010;3:122-5. Decock CE, Shah AD, Delaey C, Forsyth R, Bauters W, Kestelyn P, et al. Increased levator muscle function by supramaximal resection in patients with blepharophimosis-ptosis-epicanthus inversus syndrome. Arch Ophthalmol 2011;129:1018-22. Cruz AA, Akaishi PM, Mendonça AK, Bernadini F, Devoto M, Garcia DM, et al. Supramaximal levator resection for unilateral congenital ptosis: Cosmetic and functional results. Ophthal Plast Reconstr Surg 2014;30:366-71. Mete A, Cagatay HH, Pamukcu C, Kimyon S, Saygılı O, Güngör K, et al. Maximal levator muscle resection for primary congenital blepharoptosis with poor levator function. Semin Ophthalmol 2017;32:270-75. Lee JH, Aryasit O, Kim YD, Woo KI, Lee L, Johnson ON 3rd, et al. Maximal levator resection in unilateral congenital ptosis with poor levator function. Br J Ophthalmol 2017;101:740-46. Shields M, Putterman A. Blepharoptosis correction. Curr Opin Otolaryngol Head Neck Surg 2003;11:261-6. Putterman AM, Urist MJ. Müller muscle-conjunctiva resection. Technique for treatment of blepharoptosis. Arch Ophthalmol 1975;93:619-23. Bernardini FP, Cetinkaya A, Zambelli A. Treatment of unilateral congenital ptosis: Putting the debate to rest. Curr Opin Ophthalmol 2013;24:484-7. Kersten RC, Bernardini FP, Khouri L, Moin M, Roumeliotis AA, Kulwin DR, et al. Unilateral frontalis sling for the surgical correction of unilateral poor-function ptosis. Ophthal Plast Reconstr Surg 2005;21:412-6. Göncü T, Çakmak S, Akal A, Karaismailoǧlu E. Improvement in levator function after anterior levator resection for the treatment of congenital ptosis. Ophthal Plast Reconstr Surg 2015;31:197-201. Pak J, Shields M, Putterman AM. 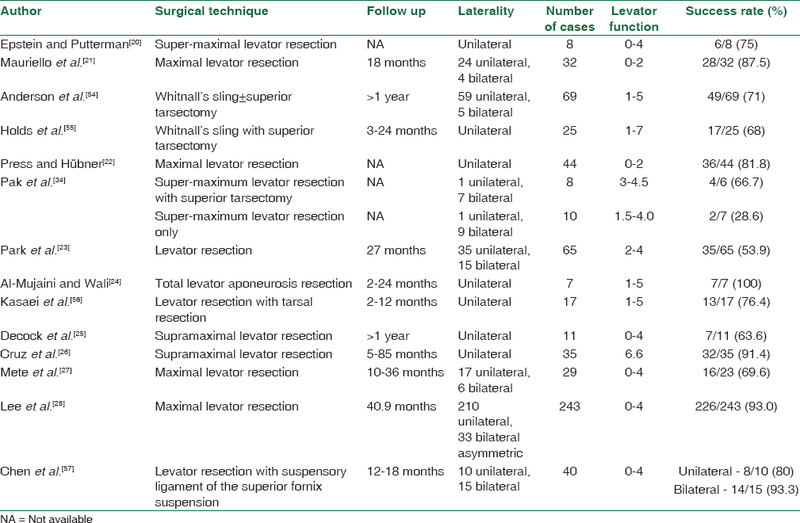 Superior tarsectomy augments super-maximum levator resection in correction of severe blepharoptosis with poor levator function. Ophthalmology 2006;113:1201-8. Arajy ZY. Open loop fascial sling for severe congenital blepharoptosis. J Craniomaxillofac Surg 2012;40:129-33. Beard C. A new treatment for severe unilateral congenital ptosis and for ptosis with jaw-winking. Am J Ophthalmol 1965;59:252-8. Callahan A. Correction of unilateral blepharoptosis with bilateral eyelid suspension. Am J Ophthalmol 1972;74:321-6. Khwarg SI, Tarbet KJ, Dortzbach RK, Lucarelli MJ. Management of moderate-to-severe marcus-gunn jaw-winking ptosis. Ophthalmology 1999;106:1191-6. Jeong S, Ma YR, Park YG. Histopathological study of frontalis suspension materials. Jpn J Ophthalmol 2000;44:171-4. Beyer CK, Albert DM. The use and fate of fascia lata and sclera in ophthalmic plastic and reconstructive surgery. Ophthalmology 1981;88:869-86. Hayashi K, Katori N, Kasai K, Kamisasanuki T. Characterization and treatment of three cases with complications after frontalis suspension using autogenous fascia lata. Nippon Ganka Gakkai Zasshi 2013;117:132-8. Hayashi K, Katori N, Kasai K, Kamisasanuki T, Kokubo K, Ohno-Matsui K, et al. Comparison of nylon monofilament suture and polytetrafluoroethylene sheet for frontalis suspension surgery in eyes with congenital ptosis. Am J Ophthalmol 2013;155:654-63.e1. Wilson ME, Johnson RW. Congenital ptosis. Long-term results of treatment using lyophilized fascia lata for frontalis suspensions. Ophthalmology 1991;98:1234-7. Woo KI, Kim YD, Kim YH. Surgical treatment of severe congenital ptosis in patients younger than two years of age using preserved fascia lata. Am J Ophthalmol 2014;157:1221-6.e1. Leone CR Jr., Shore JW, Van Gemert JV. Silicone rod frontalis sling for the correction of blepharoptosis. Ophthalmic Surg 1981;12:881-7. Nucci P, Lembo A, Santangelo E, Fogagnolo P, Serafino M. Five-year follow-up of a 30-month trial of stability of silicone band frontalis suspension for the treatment of severe unilateral upper eyelid ptosis in infants. Semin Ophthalmol 2016;31:215-8. Lam DS, Gandhi SR, Ng JS, Chen IN, Kwok PS, Chan GH, et al. Early correction of severe unilateral infant ptosis with the mersilene mesh sling. Eye (Lond) 1997;11(Pt 6):806-9. Chong KK, Fan DS, Lai CH, Rao SK, Lam PT, Lam DS, et al. Unilateral ptosis correction with mersilene mesh frontalis sling in infants: Thirteen-year follow-up report. Eye (Lond) 2010;24:44-9. Tanenbaum RE, Shi W, Johnson TE, Wester ST. Frontalis suspension with supramid suture: Longevity results in very young patients with congenital ptosis. Ophthal Plast Reconstr Surg 2014;30:110-5. Katowitz JA. Frontalis suspension in congenital ptosis using a polyfilament, cable-type suture. Arch Ophthalmol 1979;97:1659-63. Manners RM, Tyers AG, Morris RJ. The use of prolene as a temporary suspensory material for brow suspension in young children. Eye (Lond) 1994;8(Pt 3):346-8. Steinkogler FJ, Kuchar A, Huber E, Arocker-Mettinger E. Gore-tex soft-tissue patch frontalis suspension technique in congenital ptosis and in blepharophimosis-ptosis syndrome. Plast Reconstr Surg 1993;92:1057-60. Keyhani K, Ashenhurst ME. Modified technique and ptosis clamp for surgical correction of congenital pediatric ptosis by anterior levator resection. Facial Plast Surg 2007;23:156-61. Anderson RL, Jordan DR, Dutton JJ. Whitnall's sling for poor function ptosis. Arch Ophthalmol 1990;108:1628-32. Holds JB, McLeish WM, Anderson RL. Whitnall's sling with superior tarsectomy for the correction of severe unilateral blepharoptosis. Arch Ophthalmol 1993;111:1285-91. Kasaei A, Aghsaei Fard M, Tabatabaei SZ, Tari AS. Tarsal resection operation in correction of severe unilateral blepharoptosis with poor levator function. Eur J Plast Surg 2010;33:67-70. Chen W, Liu Z, Tian Q, Niu H, Liu F, Wang X, et al. Levator resection with suspensory ligament of the superior fornix suspension for correction of pediatric congenital ptosis with poor levator function. Eye (Lond) 2016;30:1490-5. Ettl A, Priglinger S, Kramer J, Koornneef L. Functional anatomy of the levator palpebrae superioris muscle and its connective tissue system. Br J Ophthalmol 1996;80:702-7. Anderson RL, Dixon RS. The role of whitnall's ligament in ptosis surgery. Arch Ophthalmol 1979;97:705-7. Nguyen VT, Hwang TN, Shamie N, Chuck RS, McCulley TJ. Amyloidosis-associated neurotrophic keratopathy precipitated by overcorrected blepharoptosis. Cornea 2009;28:575-6. Callahan MA, Beard C. Beard's Ptosis. Birmingham, AL, USA: Aesculapius Publishing Company; 1990. p. 52-87. Yoon JS, Lee SY. Long-term functional and cosmetic outcomes after frontalis suspension using autogenous fascia lata for pediatric congenital ptosis. Ophthalmology 2009;116:1405-14. Lee MJ, Oh JY, Choung HK, Kim NJ, Sung MS, Khwarg SI, et al. Frontalis sling operation using silicone rod compared with preserved fascia lata for congenital ptosis a three-year follow-up study. Ophthalmology 2009;116:123-9. Chung HW, Seah LL. Cosmetic and functional outcomes of frontalis suspension surgery using autologous fascia lata or silicone rods in pediatric congenital ptosis. Clin Ophthalmol 2016;10:1779-83.